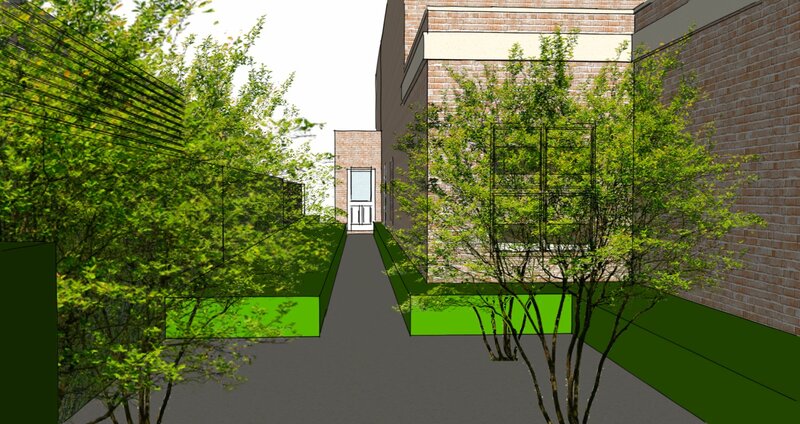 When the clients first moved into Viburnum Gate they barely used the garden. It wasn’t working for them and detracted from the house, so much that it meant they nearly didn’t buy it. 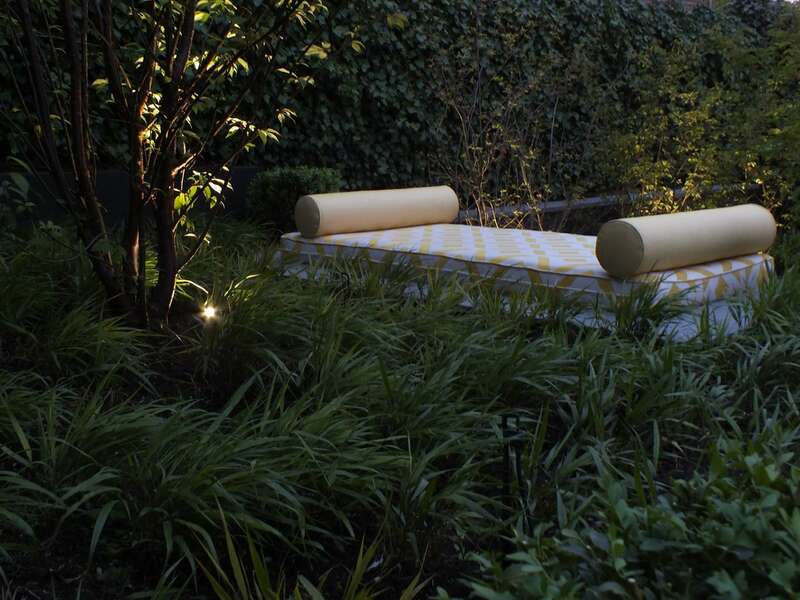 The garden was also an odd shape, and they felt that the boundaries really dominated the space. 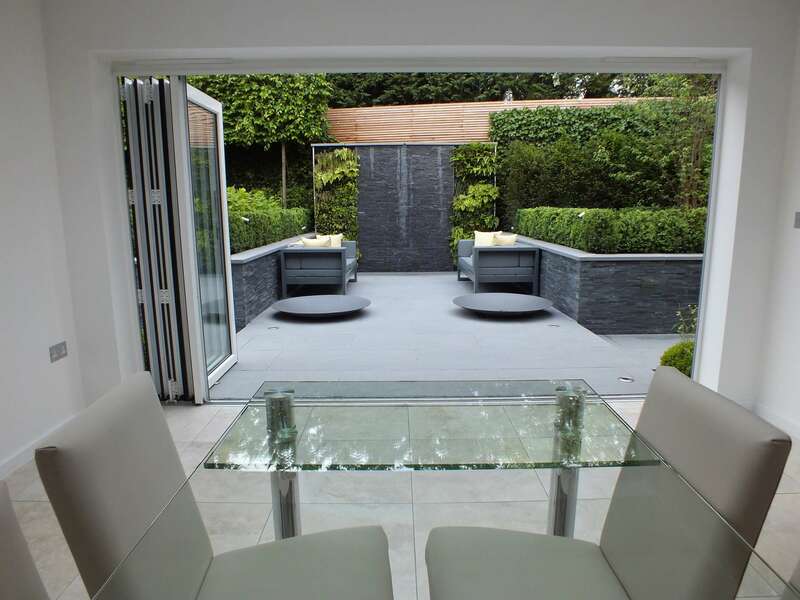 The key brief from the clients for this garden was to create a bit of a wow contemporary garden that could be used for their upcoming ‘big’ celebration party, whilst at the same time creating value for the clients, so that any expenditure on the garden would be recouped in due course when the property was sold. 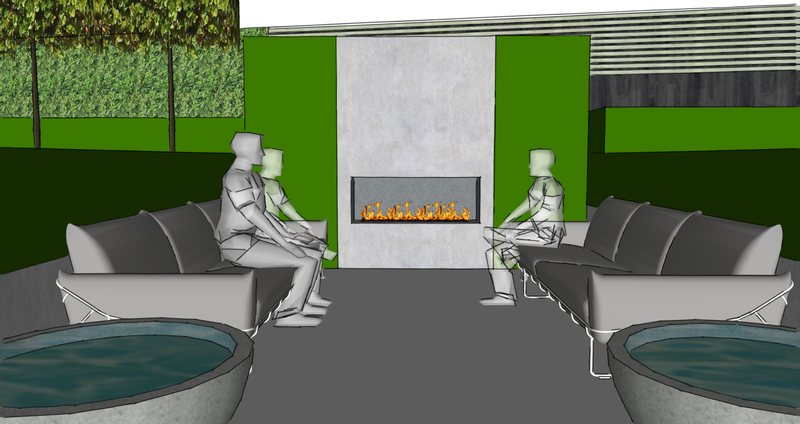 Taking both factors into account, Aralia created a design for the clients that would both please the clients but also appeal to potential buyers in the future. 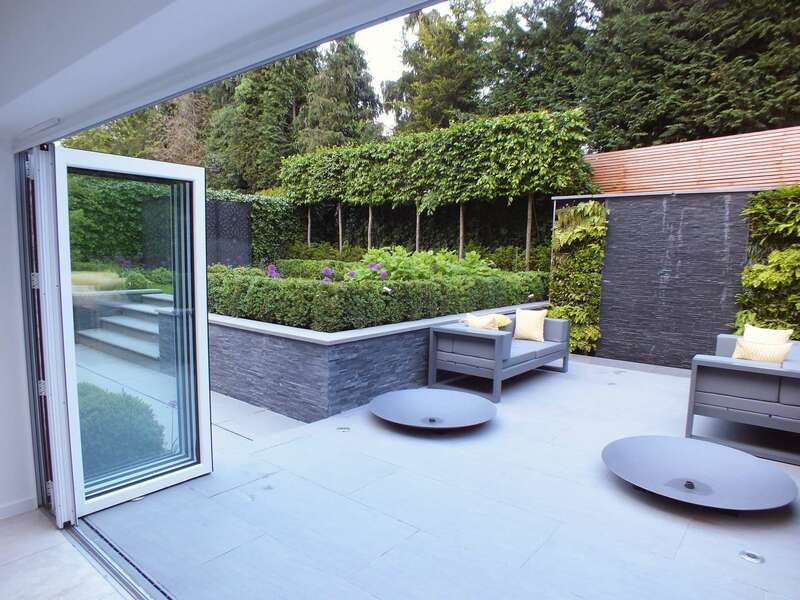 The clients requested a very elegant, minimalist design with contemporary clean lines and limited maintenance but still including that wow factor. 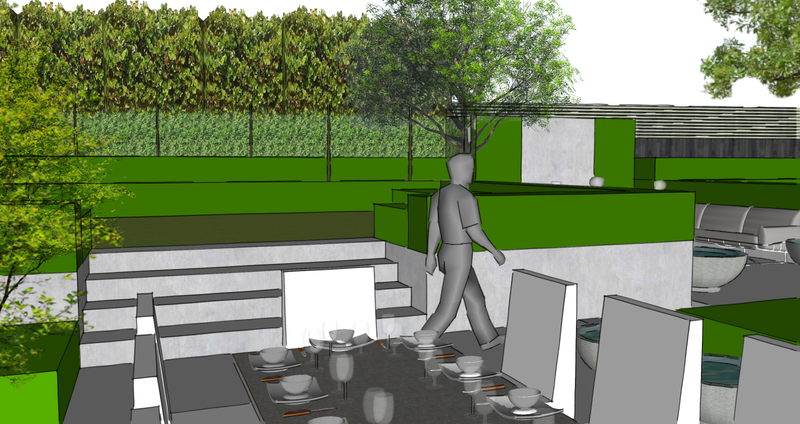 The clients also wanted the design to provide impressive views from the kitchen as a priority. 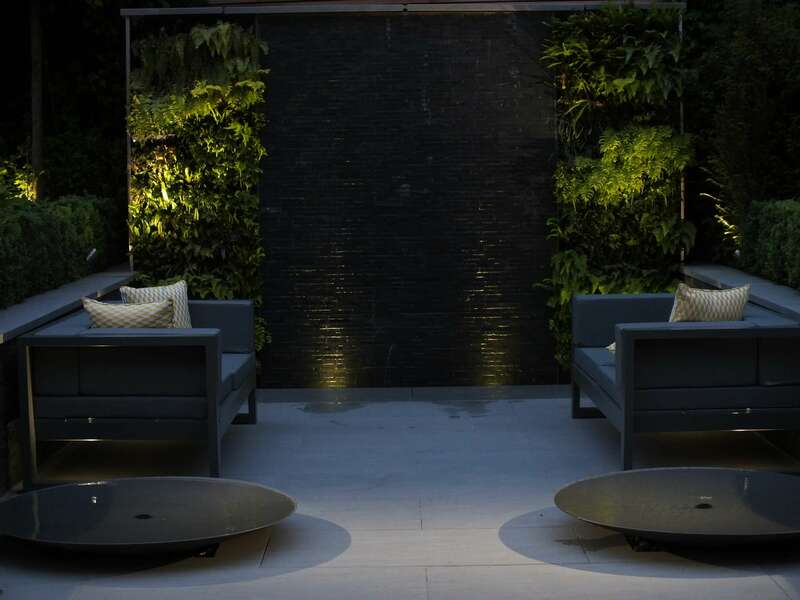 Aralia completely redesigned the space, in keeping with the client’s wishes for a very elegant, minimalist design, with clean lines and a contemporary feel. 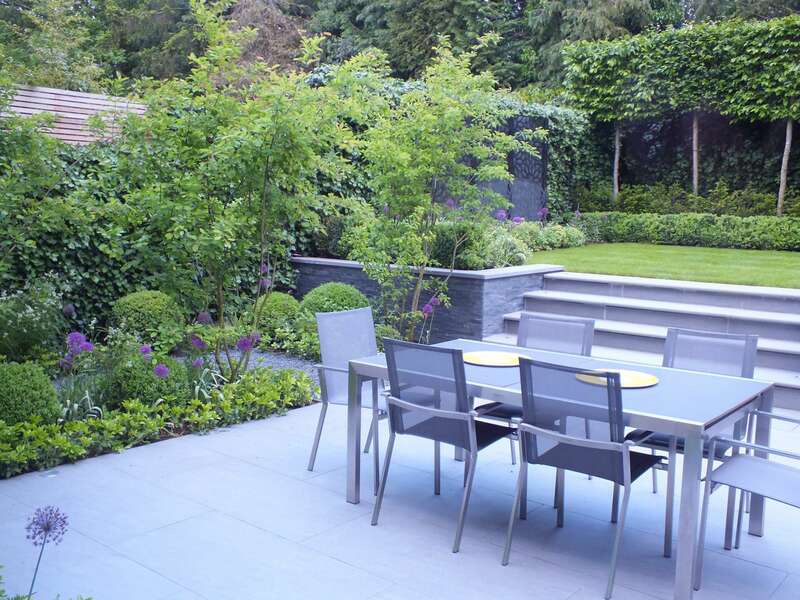 We reconfigured the terrace, providing a more seamless interface between the house and garden. 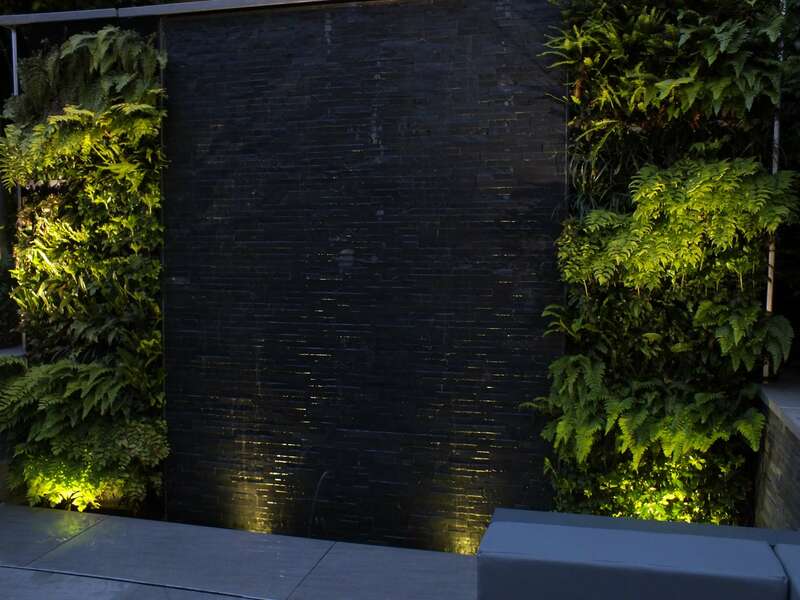 Unafraid to move walls and change levels to make it work, Aralia created a relaxing space which brings joy and delight to the family – a garden they can now also enjoy into the evening thanks to cleverly integrated garden lighting softly highlighting its key features. 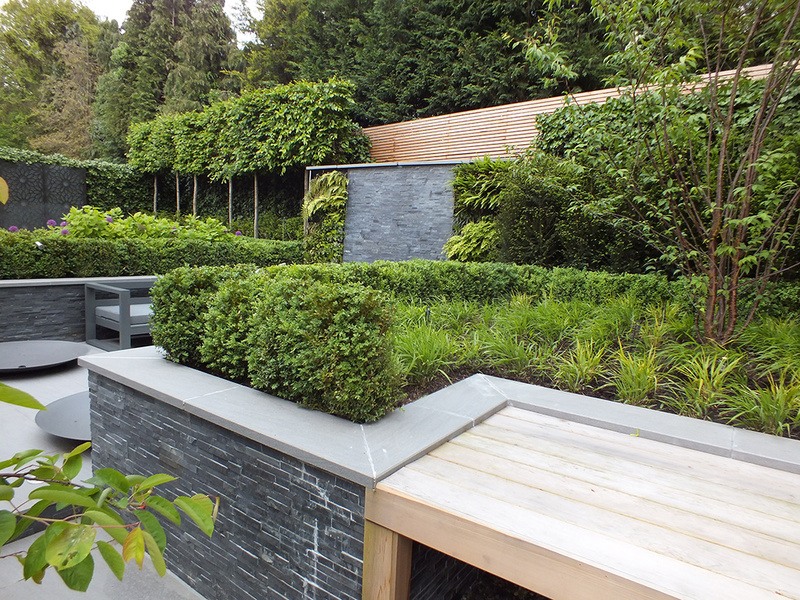 To create the perfect design for our clients, Aralia created a garden bursting with layers including sunken garden areas, green walls and pleached-tree for screening. 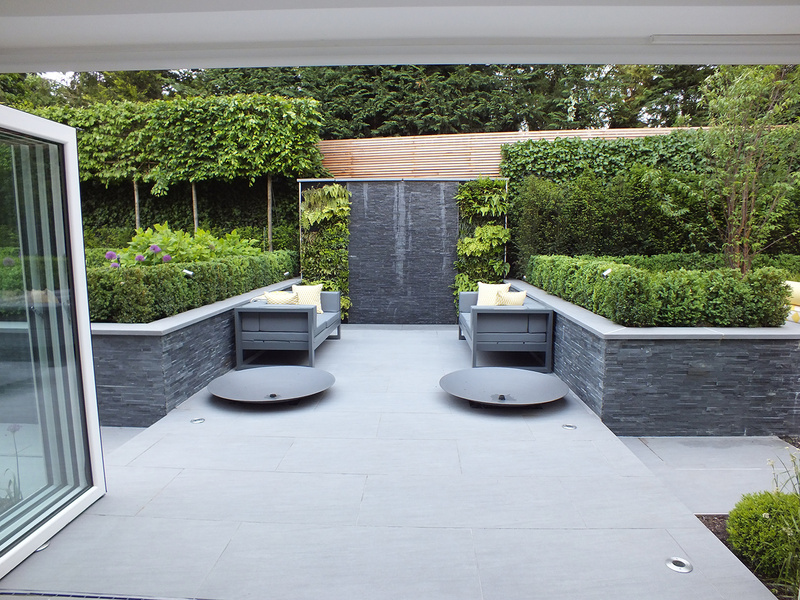 Aralia ensured that the garden would be both beautiful and practical and included features such as a bespoke outdoor fireplace, as well as contemporary lounge and dining areas. 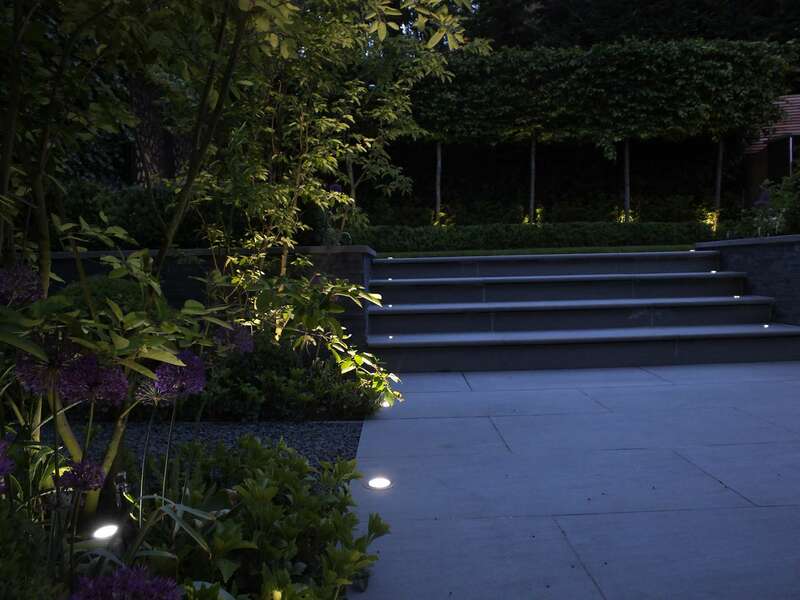 This garden space, ideal for entertaining across a broad spectrum of social occasions, also includes outdoor lighting to brighten up the garden on darker nights – creating more reason and opportunities for the clients to really enjoy their outdoor space. 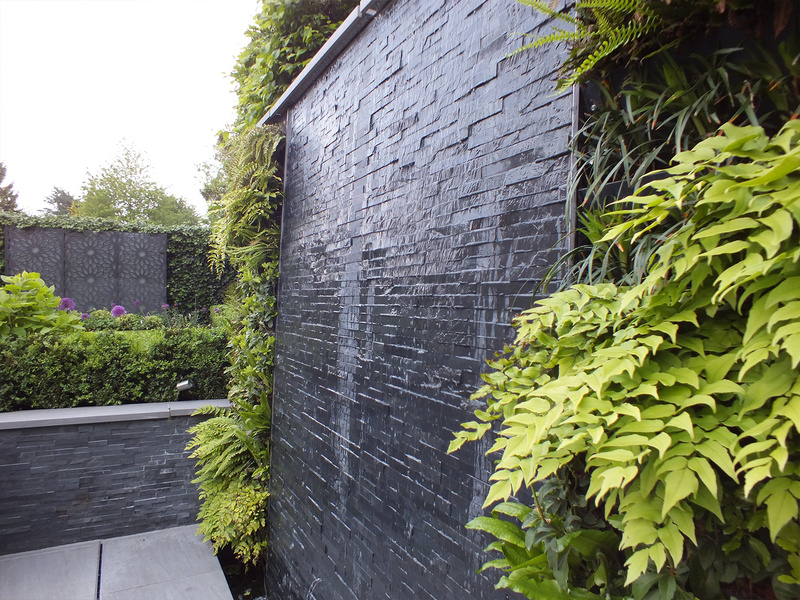 To create a stunning focal backdrop to this garden, and to make sure to keep colour and excitement within a minimal design, Aralia also included two living walls (green walls) and double hedging. 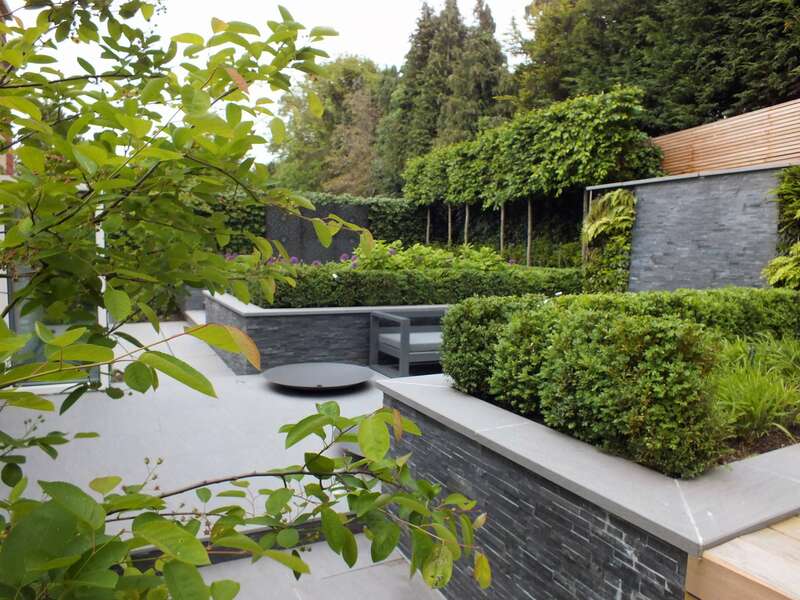 Aralia were working as Landscape Architects working within a multi-disciplinary consultant team and a range of sub-contractors. 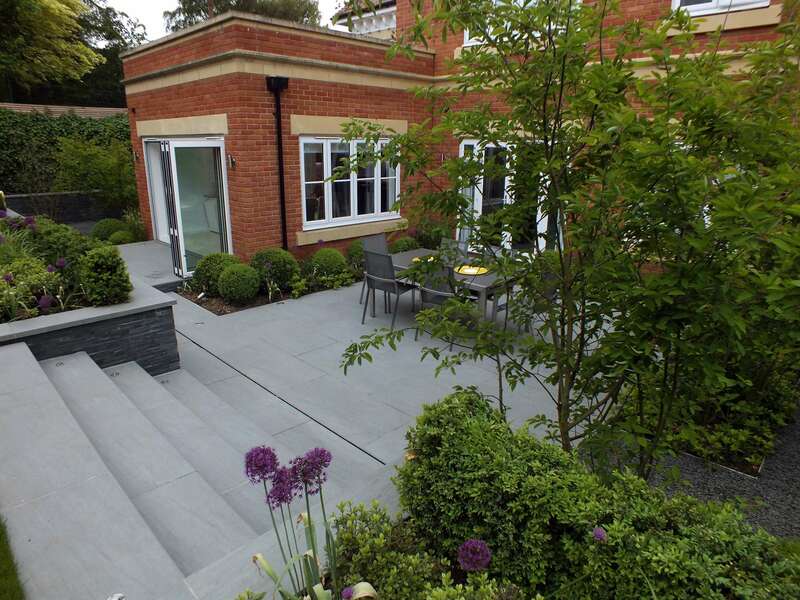 Aralia were responsible for concept creation through to design detail and site monitoring of the build. 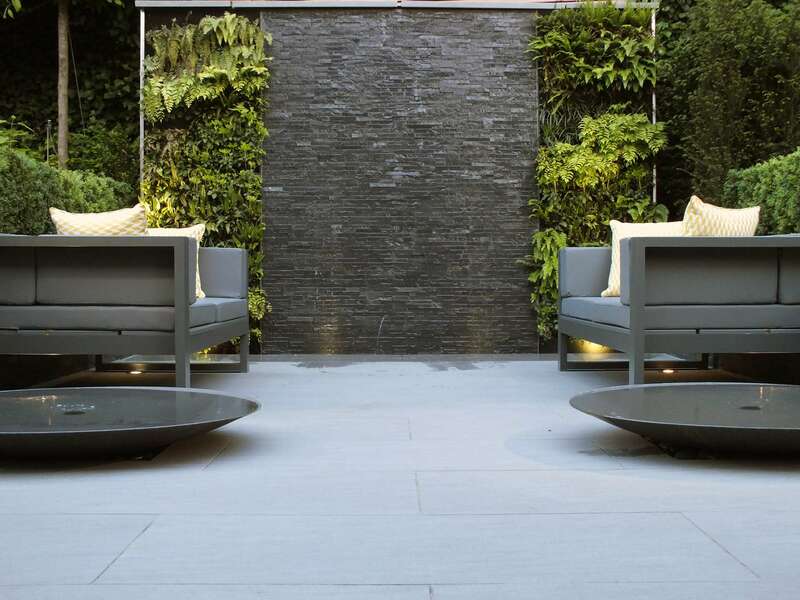 This scheme has been awarded the 2018 Bali Design Excellence Award and has also been awarded Designer of the Year award by the APL. 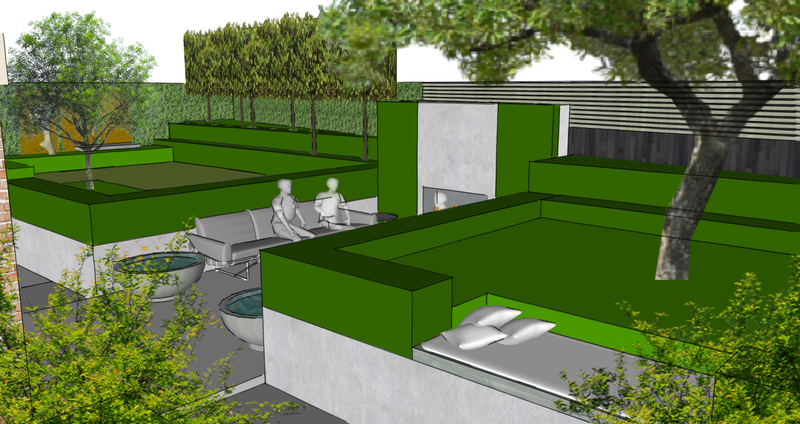 This project has also been chosen by Lux Life as ‘Best Luxury Residential Garden Design Company 2019 – UK’, & ‘Most Contemporary Garden Design Project’. 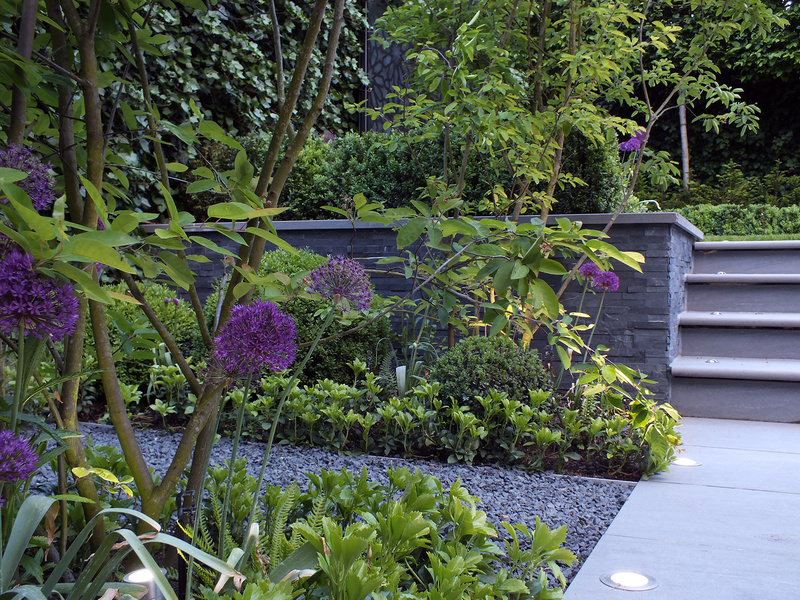 Watch the video below to learn more about how the garden design has changed the way the family enjoy their home. 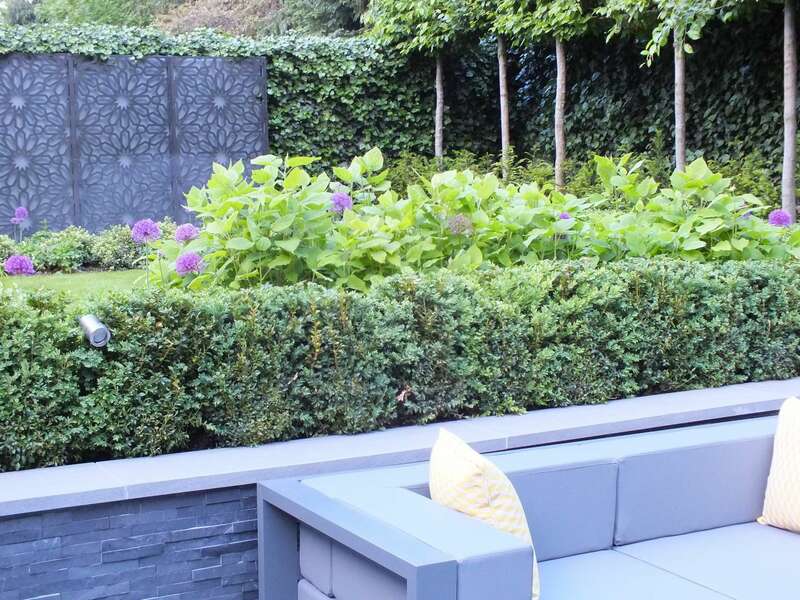 Green Walls, Contemporary Water features, Water Bowls, Water Wall, Pleached trees, Intimate Sunken Area, Bespoke Outdoor Fireplace, Bespoke Wooden Bench, Garden Dining Table and Chairs, Contemporary Outdoor Sofa, Double hedging, Garden lighting, Garden Irrigation.